Reskin damaged Aluminum - Most times it is a cost effective solution to stripping old paint and repainting the old skin. Now available is polished aluminum for all or part of a trailer at a lower cost than polishing. Paint - Original or Custom Colors. Can be matched to tow vehicle. We use a urethane automotive paint that will last for years. We prefer to paint trailers with new aluminum siding, talk to us about limitations on repainting original skin. Polishing - Nothing looks better than a mirror finish on a Spartan! Polishing available on limited basis on some bare aluminum trailers and on most trim. Window Repair - We can do the glass work, re-screen and reseal those leaky windows. Hehr windows rebuilt. Doors rebuilt... Tired of the sagging door? We rebuild the doors (including baggage) as part of the restoration process. Tail & Marker Lights - Tired of intermittent or dim lights? We can fix it! Logos - Replacement logos in original styles available. The finishing touch to any restoration. Awnings - Awnings installed, custom vintage look awnings available. Insulation - Replace that moldy bug infested ineffective fiberglass with new Polyisocyanurate insulation. Custom Countertops - Retro Restoration will replace counter and table tops with new laminate, many cool retro patterns available. Flooring: New custom flooring in multiple colors or pattern... Limited only by your imagination. Upholstery - We can handle the rebuilding & recovering of the seats, upholstery done by a professional shop. Water Systems - New fresh water systems, retrofitted with demand pump. Water disposal (gray & black) too. Electrical Systems - Wiring restored or upgraded. 12V or 110V systems. Optional 12V converters installed. Propane systems upgraded with new regulators, all propane lines checked, replaced as needed. 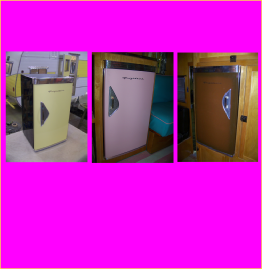 Appliance Refinishing - Make those old appliances look like new! Custom colors available. Retrofitting with Modern Conveniences - Want the vintage look, but modern conveniences? We can add microwaves, entertainment systems, air conditioning, etc. Just ask! Custom interiors for special uses. Axles, Brakes, Hubs - We check out the axle assembly to make sure it is ready to roll. Bearings repacked. If any question on condition we can replace the axle assembly with a brand new Dexter Axle for years of trouble free service. Wheels/tires - We always use trailer rated tires for safety. Wide whites... No problem for a good safe tire with the classic look. Original wheels sandblasted and painted or replaced with new rims... Our trailers always include new Baby Moon Caps. Tongue, hitch - Tongue sandblasted, primed and painted. Hitch inspected to be in good working order or replaced. Tongue jack repaired or replaced as needed. Safety Chains - Be safe with new dual safety chains. Retro Restoration specializes in complete turn key restorations. 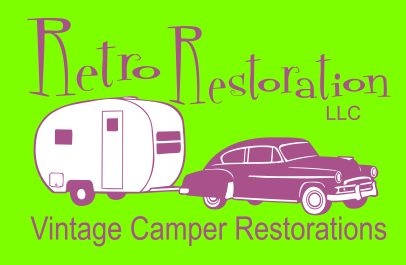 Our trailers are true restorations, not simply a cosmetic refurbishment. Thanks to new and better materials our trailers are usually in better condition as they were when they came off the showroom floor! Our campers look brand new with new aluminum skin with classic colors or our polished aluminum. It’s the attention to detail that make our trailers stand out! Interiors from authentic originals to full custom designs feature a wide variety of finishes, flooring, fabrics and laminates. 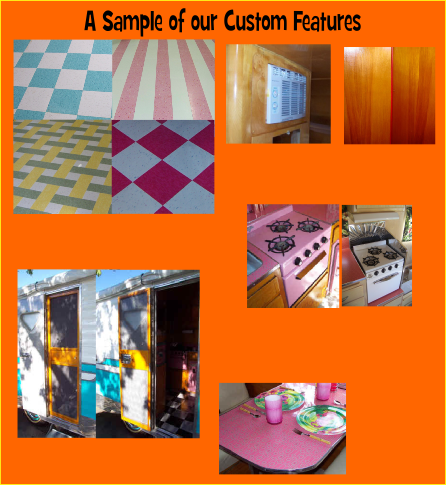 We can turn a vintage camper into a mobile business! 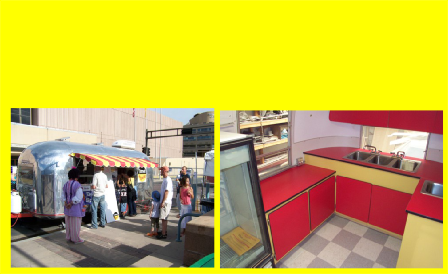 Food Carts, Gift Shops, Office... You dream it, we’ll build it for you! Custom flooring in a wide variety of colors and styles, 9” tiles like original. Custom wood screen doors to replace the aluminum ones. Stay Cool!!! Custom AC installations. New gimp in neutral or colors adds detail! Appliances refinished in color... These were ugly chipped brown. Custom backsplashes too! Custom designed table/counter tops available. Ask about our CUSTOM Frigidaire Refrigerators! Retro Restoration does Appraisals for Insurance! Call for Details!